In the interest of conserving paper waste on multiple notices and never missing an issue, we provide continuous service and will automatically renew your subscription at the best rate available with guaranteed savings off the newsstand price. We will always send you a reminder before your card is charged. If the credit card you provided cannot be processed a bill will be sent. 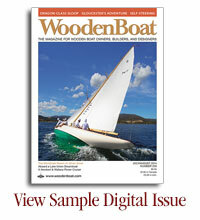 Thank you for subscribing to WoodenBoat!